this thing is across the street from my house… I tried going into it once, but didn’t have a flashlight… went back a few days later and they welded the door shut! Can you send me those videos? Would LOVE to see them. I spent many a hurricane inside during the 1970’s as a ham radio volunteer & knew well most of the people who worked there full time. It was built as a prototype for the nation. It contained decontamination showers, radio room, private offices, situation room, engine room with its own generators, had its own water & air purify supply. The 2nd floor contained men’s & women’s bunks, operating room, kitchen & cafeteria. If it had been city comm post during Katrina, we would have been able to summon help immediately. 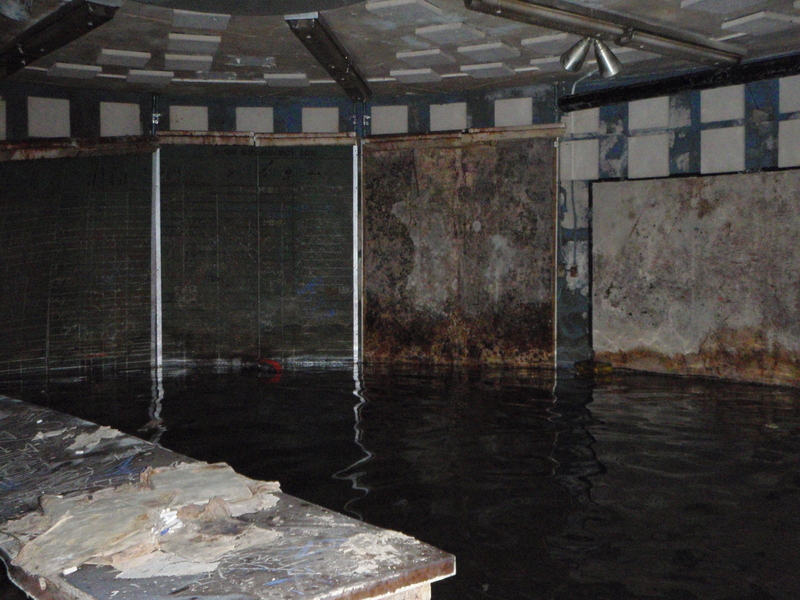 No flooding inside when sealed unless the water had gotten to top of diesel intakes, which it didn’t. The flooding you see was from busted pipes & years of neglect. It’s sad to see it in such bad shape. It served NOLA well through many a storm. I earned my HAM license there in ’80 with the old MTA amateur radio club (now no longer.) It was starting to show signs of age then, but there were supposed to be plans in the works to rehab it, guess it didn’t happen, like so many other things that would have been good for N.O.! I believe that I would like to se it refurbished and returned to service. But that probably wont happen either. All my life I wanted to go in that shelter….glad you two did it and not me. Glad I came across your site. I would love to see you have an adventure at the Old Lakeview School in th 5900 block of Milne in Lakeview. I got in years before Katrina and it was pretty neat. I imagine it is a wasteland now. what a wonderful tour. i grew uo in lakeview and have always wondered what was beneath that “mountain” of green grass. my younger brother has claim of breaking in as a high school student at jesuit but did not say much about it. i went walking a couple of weeks ago and saw someone standing guard so i did not enter. thanks for the info andif there is anything that we can do to make it “something” again, keep me posted. It had been mentioned as a possible site for a museum/park area a few months back at one of the Lakeview Civic Improvement Association meetings. I’m trying to dig up some info on that to see if the idea is still being kicked around. man yall crazy.but it was pretty kool too watch. I’m so glad my cousin who grew up in New Orleans sent me your site. I grew up about 100 mile from New Orleans & lived in a big antebellum home in Ms. Our next door neighbor had a boom shelter, & altho it never had to be used for anything major, Thank God, it was a great place for us kids, back then, to go play & have our secret club meetings in. Yours is really cool, tho. I think that I took a tour of this place back in Kindergarten…..1968. Excelent… I would love to go down there again.. While working at a Major New Orleans hospital in New Orleans in the 1980s I used to go to the Shelter every month for a meeting of MANA (Mutual Aid of New Orleans). We would eat a lunch, have meetings planning for natural or man made disasters, and discuss co-operation between corporate, government and military resources. We did not discuss anything near Katrina sized incidents. I also remember it being built when I was a child living in Metarie. I always wanted to go in it. It was a bit run down in the early to mid 80s, but it was impressive still. Corey V – good suggestion, that was “Camp Parapet” you’re thinking of, I think? It is between Jefferson Hwy and River Road about one block off Causeway Blvd. It was an old Confederate fortification and the only part of this remaining is an old powder magazine, which you can see from Causeway Blvd. (if you take Causeway all the way to the river, you’ll see it off to the left between Jeff Hwy and River Road). I think sometime in the last couple years they opened it to the general public. I forgot about it until after the event so I’ll have to wait another 100 years for the next time they do this, I guess. The videos were suspenseful and awesome. You guys are way braver than I would be. As soon as I read the “dead body” graffitti I would have been outta there. I wanted to throw oxygen masks into the video for you, that fungus looked scary! When I was a kid we used to ride our bikes down the “mountain” of dirt around the shelter. What a ride! We also hung on the wires and the “little ants” would come scurrying out of the shelter yelling at us because we were screwing up the power and water in the shelter. Eventually they put up a fence to keep us off the shelter. SO COOL (after 40+ years) to see what the inside looked like. I was the Deputy Director of New Orleans Civil Defense (NOCD) from 1980 through 1984. My office was in the lower level of the “bomb shelter”. Prior to that I was a volunteer with NOCD for over 20 years. I resigned in 1984 because of my frustration with city politics that severly hampered the ability of NOCD to be a truly effective agency. The shelter was officially opened in 1962 and designated as a regional emergency operations center (EOC) for southeast Louisiana. However, NOCD offices and operations remained at New Orleans City Hall until the middle 1970s. During that period, the EOC was used only during emergencies and for disaster exercises, training classes, etc. 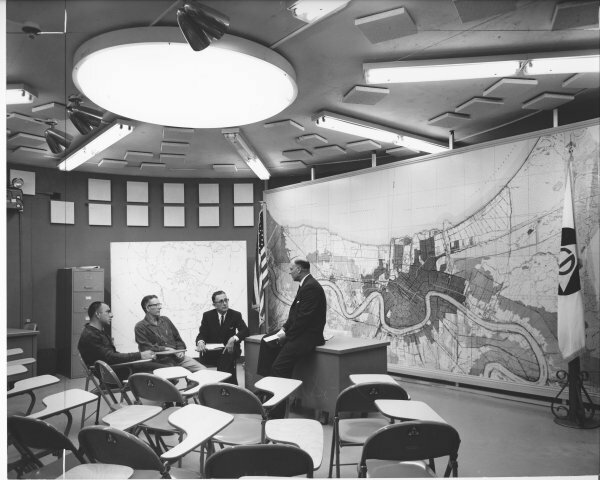 In the 1970s, because City Hall needed the space for other purposes, NOCD offices and personnel were moved to the EOC. There it remained until the early 1990s. Because of the cost to maintain the building, and a dispute over who was responsible for the maintenance, emergency management operations moved back to City Hall to a small cubby hole on the ninth floor. I have been told that the water in the EOC is not due to cracks in the walls but to condensation since the air conditioning was shut down when the building was abandoned and left open and unsecured. The circular wall, the base, and the domed roof of the building are constructed of three-foot thick high density steel reinforced concrete. It would probably be too costly, unless a federal grant could be obtained, to renovate and modernize the building. It is, however, a well-built structure that could be put to good use as an EOC or, perhaps, as an extension of the Cold War Museum. I enjoyed watching the videos. I was concerned about air quality, dangerous fumes, hazardous materials, and living organisms including those that wiggle in the dark. I hope that you guys didn’t suffer any ill-effects. I would be interested to know if there is anyone else out there that sees a potential for a refurbished building. I remember Lou Reese, and CD people who went before him: Charlie Erdmann (Col-USA ret-who’s buried in Arlington Nat’l) the previous Director, Bobbie his secretary, John Cowart, Moe Jauchler-Communications, Daigle, Freddie & the others. The volunteers, including ham operators, manned the radios w/ Dwight ‘Smitty’ Smith. That was a great bunch of people who I’m glad I had the honor of working with. They always tried to do the right thing, and cared about ‘their’ city. There were 2 stories, both underground. The ‘bottom’ story at the bottom of the stairs held the decomtamination shower, radio room, commercial radio station as you entered. There was a round central meeting room with circular hallway on the outside. The rooms on the outside of the hallway included the Director’s office, and Engine Room with diesels, generators, & other machinery. Through an interior stairway you accessed another round room on the 2nd desk that served as an eating facility/ meeting room. Around the outside of this room was the operating room/infirmary, ladies bunkroom, men’s bunkroom, and kitchen with serving line & stoves. Pictures above show the size of the main rooms. I was a telephone installer-repairman for So. Central Bell Telco in the 1970’s and 1980’s in eastern New Orleans and I had the experience of installing local telephone lines in the fallout shelter for use with voice analog telephones and fax modems. It was in fair shape back then and I was able to explore much of the shelter. It was one of the most unique experiences of my telephone career. There is a bomb shelter at the corner of Leon C. Simon and Franklin Ave. in an abandoned house. I was wondering if you two would go down inside it and video whats in there, it would be pretty interesting to see if they had any Cold War relecis down in there. that sure looks like a lot of fun but those guys are about one breath away from dying. They just entered a big confined space with no fforced ventilation and no atmosphere monitoring equipment to make sure the air is safe to breathe. The “air” in that building could be full of carbon dioxide, methane, or hydrogen sulfide from decomposition of the sludge on the floors and under the dirty water. They said the air was “thin” and it probably has a lot of carbon dioxide in it. These guys are risking their lives. It looks like a lot of fun but they should invest in some monitoring equipment or big fans to pull some air through the shelter. It’s like you’re entering Vault. see Lou Reese’s comment of Jan 22 for the ‘full’ story-short for Politics. It was a great facility that would have served us well in Katrina. I always wondered why they built it on ground level, didn’t they realize it would flood? 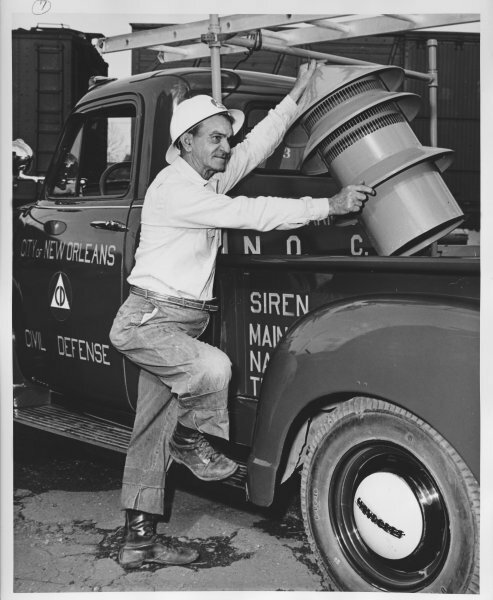 My Dad managed a lot of downtown buildings during that period and was required to maintain water supplies and such, the stuff was provided by the Feds and they checked up on it regularly during the cold war. I remember eavesdropping on a conversation where my mother was chewing my Dad out about complaining about all the crap he had to do regarding the stuff in the basements of the buildings. I saw this “bunker” almost every day as a child from 1965 – 1970 until we moved to Metairie. In 1984 ( I was an officer with St. Tammany Civil Defense) I decided to stop ~ it was still operational at that time ~ the staff (consisting of representatives of the Army & Air Force, NOPD, NOFD, Mayors Office,… was kind enough to give me a guided tour ~ wish I had a camera. I was impressed. Inside there was a mini Emergency Room / Dental Clinic / Infirmary, Communications Center, Mini TV & Radio Studio, Kitchen / Food Storage, Sleeping Quarters for about 100, an Armory, and a few “escape Tunnels” one of which I was told extended to Vets Blvd.? Even got to see the old black Mercedes? that was always in front for two decades~ it was armor plated. I was disappointed to learn about it’s demise when shut down in ’85-86. It could have been modernized without too much expense. Today ~ 2012, there is hardly any indication that it was even there. I’m lucky in the respect that I was one of those who saw it almost every day and wondered, and later have my curiosity satisfied. The few B & W pics that I’ve seen so far on the internet don’t really do justice to it. I’m like Anthony – we used to drive past it all the time when I was a kid. It was a kind of landmark and very intriguing. I had NO idea it was so spacious inside! Nor did I know that anyone actually worked in there! Be happy to send detailed drawings of the EOC to those interested. I write fiction and featured it in a couple of stories. 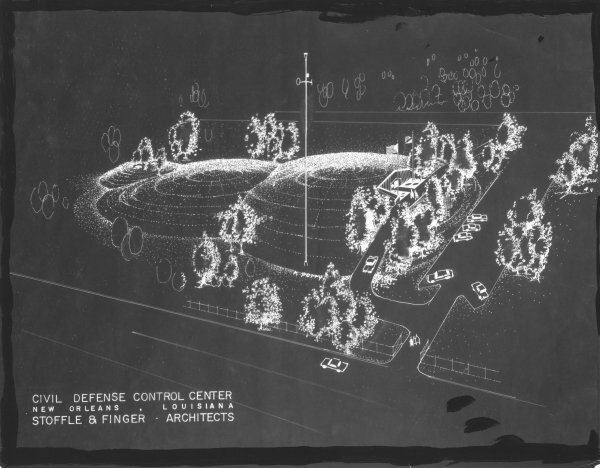 PAVE BOLO:Target Iran and 411: Cybergeddan both feature an “alternate history” version. These stories are carried by Amazon, Barnes and Noble, Sony, Apple, etc I believe you’ll enjoy them. I also did a piece on Ponchartrain Beach for your enjoyment . Does anyone know who owns the shelter???? Interesting to see that there is still interest with the building, and to see familiar names like Lou Reese, Mary Vernoy and others on this site. I was asked to return to New Orleans from Richmond VA last December to address the New Orleans Tour Guides Association about the EOC building and what it had contained, and it was distressing to come across the pictures of it’s present state . I had been one of the engineers responsible for renovating it in the early 1980s after it fell into disrepair in the late 70s. The building was ultimately shut down when the casing of the 1400′ deep water well cracked during the driving of pilings for the Regions Bank on the opposite corner. That rendered the air conditioning and generator cooling systems inoperative, which basically forced its closure. At the time, the cost would have been $77,000 to drill a new well, which would have been easily worth the money. We had attempted to get the well fixed, but the then CAO of the city wanted the property abandoned. Had the well been repaired, the building would never have had to close, and the place could have continued to be a great emergency operations center for the city. The designers had thought of everything in planning it. My crew and I spent many hours in that facility, reworking the mechanical plant and also volunteering as ham radio operators under Communications director Moe Jauchler and CD director Captain Estopinol. It is sad to see what has become of New Orleans and too many of it’s landmarks, and I am glad I don’t have to drive down those streets every day and think of what once was. I was in the EOC many times via Civil Air Patrol missions, etc. I have some questions and info for you. Can we converse? I Am at swausten@hotmail.com. Can pls reach out? I am glad to see so much continuing interest in the old NOCD “bunker”. At present, I am working with representatives of preservation organizations, planning agencies, restoration architects, museum advocates, and a host of other interested parties in an attempt to restore the building and use it as a museum, training facility, and resource center. As we make progress on this project, I will try to keep everyone up-to-date on our progress. Does anyone out there know the year the CD sirens were taken out of service? There was one behind my Mom’s house on Honesread Ave in Metairie that blew at noon every day for years, but is no longer there. Pretty impressive! I always wanted to see then inside like very single person that ever lived or grew up in Lakeview!! I would be willing to refurbish it with the help of others… Maybe make it into a museum?? Everyone knew about it in the ’60s and ’70s! It was and still is there! check it out I think on Lakeshore Dr. just before Robert E. Lee. Used to be a big deal! From 1925 I was raised at 8400/6932 Pontchartrain Blvd. Living across the street from the shelter when they were building the shelter, my father brought coffee to the workers daily. He died 5/10/61 before the dedication of it. On the way to St Louis King of France Church in Bucktown, his funeral procession went down West End Blvd. As his hearse passed the shelter, all of the workers lined up along the road with hats doffed, saluting him. That pleasant memory will remain with me forever. I lived in Lakeview until Katrina took our 338-12th St home. I went to many training functions and meetings in the EOC – the Emergency Operations Center – and spent Hurricane Camille there. It was quite a facility and the designers, ex military, we’re very skilled in the lay out and use of space. I have floor plans if any one is interested. Where is this paradis? Need directions! love the website! going to use it to check out some local places like this! me and my gf noticed the door was open today so we walked all the way down to the bottom level where we saw its still flooded, so we stood there looking around for awhile and i took a few pictures. I would have loved to adventure into it with yall, I love learning the history about my city like this. keep up the good work! I go to the lakefront a lot and thought it was always a hill till my girlfriend told me what it was today as we passed. I said are you serious? she said yeah so I turned around and saw the door was open. I parked my jeep by the street and we went inside and down the stairs until we got to the bottom an saw it was still flooded. Thanks for sharing your exploration. I always knew about the place but had no idea what it contained. Sealed up but still creepy. Wow y’all are brave and daring and nuts and I love it!!!! Now that would make a great place to live. Lots of cleaning up and construction but neat. Is that place still there? I don’t think you would want to try to turn that into a home. Aside from the fact that it’s mold heaven, and raw sewerage has probably backed up into the building and permeated all of the concrete walls because of the sewerage ejector pumps not running, it would be terribly expensive to run. It required 40 tons of air conditioning. Add to that the fact that you would need motors and pumps to pump sewerage up to the level of the city sewer, There is also an issue with huge diesel fuel tanks in the ground. That would probably make it a hazmat site if the tanks have leaked, which they probably have by now. I understand it was abandoned after well casing cracked making it unusable. The shelter was last used during the police strike at Mardi gras around 1978. Prisoners were taken there for temporary holding. I still stop by every now and then but no improvement with the water levels. Still staying close to the top of the doorway at the bottom of the stairs well.